5 Ways YouTube Can Help Your Online Marketing - InsideOut Solutions, Inc.
YouTube has grown into one of the most popular websites worldwide in the past couple of years. With over 2 billion videos viewed daily, it as emerged as one of the top search engines for content. As mobile technology grows so does YouTube with over over 100 million mobile view per day. With the demographic of users being between 18-54, it can help a wide spectrum of businesses reach consumers. YouTube has allowed you to create your own channel and they have recently made changes to allow more branding and easier navigation for users to interact with your content. YouTube provides you with a number of different ways to add SEO value and incorporate geographic indicators. As with standard SEO practices, you are trying to communicate with the search engines how relevant your information is to the user. As you have probably noticed over the past year, an increasing number of videos are starting to show up in your search results. In this article, we will explore some simple steps to help build the search engine visibility of your videos. The title of your video should reflect the content of the video. It should also contain the appropriate keywords that you want to promote. This step is very important because it is the primary way you will gain exposure in the search engines. Remember that your title is limited to 100 characters, which isn’t that long, so you should get as specific as possible. Your geographic location (or the location where the video was shot) should be included in the video title. As users and the search engines become more hyper-local it’s important to include the city, state, or region that the video content is depicting. 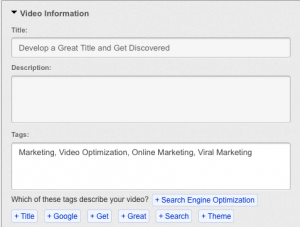 Tags are used to add the relevant keywords that describe your video. 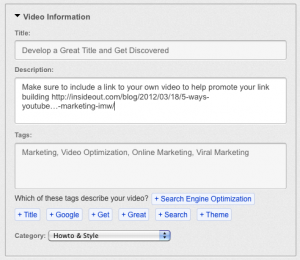 The best way to find the effective keywords for video search can be found by using the Google Keyword Tool. This is a free tool that will show you what terms are popular and are being searched. Remember that sometimes what you think the keywords should be aren’t always what consumers use to search. You only have about 20 keywords you can add to this field. So during your research narrow down what keywords are most important and relevant to the video and don’t use ones that have low search volumes. You are provided with a field that allows 2-3 sentences that is used to describe the video. This description is important because this is what viewers will see when it comes up in search. One hint is to include the video’s URL in the description which will create a link back from YouTube to your site. 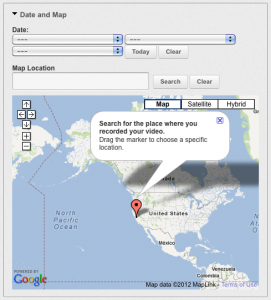 YouTube allows you to add geographic indicators to your video which will reinforce the specific location of the video. This is important because Google and other search engines are trying to show the most geographically relevant content to it’s users. This simple step will increase your chance of your video being shown in local search. This is the tricky step in the process. Users all love video content and from the stats it’s showing a never ending growth curve. So creating helpful and useful videos about your area, business, product or services is a must. Professional videos are always the best because of the editing and sound quality. But don’t shy away if you can do it yourself. Some of the most popular videos are done by non-professionals who had a video camera, creativity and a little know-how. Here is a great video that walks you through this process and will help you to get started. I hope you found this article useful and can find some creative ways to create video content and promote it online. With the growing trend of video content, leveraging this marketing tool will help your business to grow.